A new place for foodies in the centre of Bratislava, where tradition and nobleness got a divine contemporary twist is opened and fully running. As Bratislava is rapidly becoming a European capital with an attractive touristic offer, new places are opening up in the city all the time. But the opening of Globo Restaurant, in the very historical center of Bratislava, was one of those eagerly expected openings, that the whole city talks about. Three big names of Slovakian culinary scene joined their forces and knowledge, and opened Globo, a restaurant that couldn’t become nothing less than a big success. The men behind the project are the owner Peter Matyašák a well known gastronom and wine maker, Dominik Baránek the general manager who was also titled the Slovak Somelier of the Year, and who left Kaspar’s in Savoy London to join Globo project, and Branislav Križan – one of the most talented young chefs in Slovakia and the Vice President of the Slovak Association of Chefs and Confectioners. 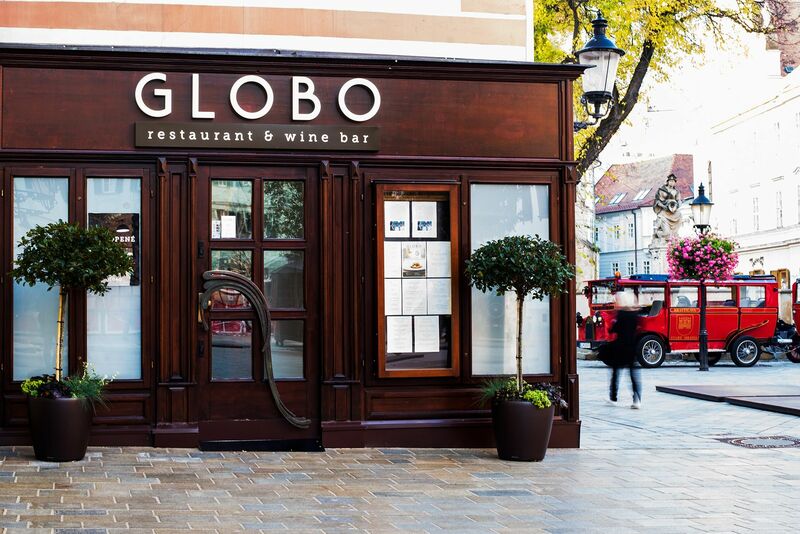 Globo is housed in the corner of Franciscan square (Františkánske Namesti) – the ground floor is the neatly designed restaurant with fine, noble atmosphere, and the underground floor is the wine bar. Looking at Globo’s interior design, menu or the wine list makes it clear that the restaurant is not aiming for the average. The style of cooking is modern with some local traditional accents. And the supply base is mainly all localy-sourced fresh organically-certified. The long-lost recipes and ingredients are reimagined and reinvented with a contemporary twist. And the wine list is set to please every taste – 150 local and international wines and some exquisite, over 20-year-old local spirits await the guests. Globo Restaurant & Wine Bar is certainly a perfect choice for your private or business meal, or to just enjoy some time over a nice glass of wine. For the best experience, the friendly and knowledgeable sommelier is there to guide the guests, when choosing the right wine to accompany their dish. After your delicious meal, take a walk to some of Bratislava’s main city attractions – the Castle, Nedbalka gallery, museums, that are only a short walk from the restaurant.